A highly convivial tour with dog, from Los Angeles freelancer Konik. 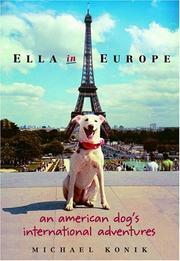 Ella, a big, white, good-tempered, Labrador-greyhound mix, serves as her proud owner’s unpaid claque. “No matter your failings,” he writes, “you [are] still a hero to your dog.” In return, Ella gets unabashed affection from Konik (Telling Lies and Getting Paid, etc., not reviewed). She also gets a trip to Europe—a small recompense, now that she is 70 (in dog years), for all the pleasure she has brought into her master’s life. Unlike the US, which severely circumscribes the freedom of dogs, Europe weaves them into life’s daily tapestry. The Louvre, the casino in Monte Carlo and a pizza joint in Cannes turn Ella away, but they’re about the only ones that do. It simply takes Konik’s breath away that he can be everywhere with his great good friend. Ella in a gondola? No problem. Ella in a bar watching the World Cup? Of course. Ella also visits a Hermès shop, dines at Le Grand Véfour restaurant (three stars, Guide Michelin) and is offered a glass of wine to soothe her jangled nerves during a lightning storm. These pages offer plenty of easy fun, but they tug at something deeper as well: When Konik writes, “Ella reminds me that comfort with oneself is the key to comfort in your environment, no matter how grand (or squalid) it is,” he touches on one of the great tools of travel. When we deny ourselves everyday access to animals such as dogs, he further reminds us, we lose our ability to comfortably associate with a population of creatures and forsake their affirming, heart-bracing qualities. That’s quite a loss.